New: Read our blog for special offers, news, and updates from Elaine Sexton at the Old Rectory and Rectory Cottages. We are situated just north of Lacock village, off the A350 near Chippenham in North Wiltshire, two hours from London. From M4 junction 17, follow the A350 south past Chippenham. After approximately seven miles, you will come to a major set of double traffic lights — Lacock is signposted straight on at this point. Turn left at the lights and follow the road down towards Lacock village. The Old Rectory is the first driveway on the right, and is signposted. Take the A350 north and follow signs for Lacock. Drive through Lacock village, past the George pub on your left; the Old Rectory is 200 yards on the left, up the hill out of the village. Ten minutes from M4 Junction 17, one hour and thirty minutes from London by train. 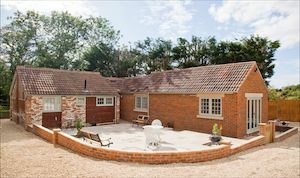 The Rectory Cottages are our self-catered holiday accommodation: two contemporary barn conversions within the Rectory grounds, just two minutes walk from the heart of Lacock. © 2017 Elaine Sexton. All rights reserved. Please email us for our access statement.